When the opportunity to review The Celestial Almanack by Classical Astronomy came up I was so excited! It came at just the right time for us because we were in the midst of reading Every Soul a Star by Wendy Mass. The linking factor in her book is all about the stars, sky, and specifically a complete solar eclipse. Her book spurred a renewed interest in our night sky. Here’s my problem, I am terrible at finding things in our sky. No matter how many trips to the Planetarium I take, I still struggle! 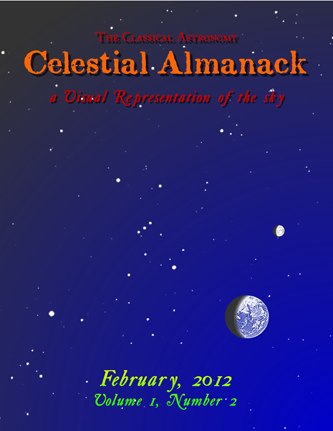 In walks The Celestial Almanack! * The Sun is moving higher in the noon sky, and rises and sets farther to the north, and how this relates to the days growing longer. * Mars and Saturn are visible earlier in the night, and are well placed before midnight. * Discover these planets and also many bright stars on the evenings when they line up with the Moon. The February Almanack starts right out with a great explanation of the 29th day in February which we experience once every 4 years. I had never even thought about why, but as the day approached my kids were very interested in reading, and hearing about why we have this strange extra day sometimes, giving us 366 days this year! The book then continues on through not only the night sky for February, but explains the daytime sky as well. Between the easy to understand explanations, and the detailed illustrations to accompany them, even I was able to locate things in the night sky, and help the kids to locate things as well. One evening we were driving home and my daughter pointed out this very bright spot in the sky, (one that was not in the direction of the North Star). We scurried home to check out the Celestial Almanack and were greeted with a plethora of information about Venus and Jupiter being the brightest objects in the February night sky! I love the fact that these short volumes (this one being 21 pages) are specific to what you are seeing right now in the sky. It makes the process of figuring it out, a snap! There was only one thing that was a tad frustrating for me in this book, that was the multiple mentions and links to reference their other products (such as their curriculum, and past almanacks). It in no way takes away from what a great resource this is, but it does make you feel as though you are missing something (which is good for them in that there is a good possibility you will then purchase other products from them). The second thing I would note is that if you are looking for a “curriculum”, that this is meant to be a supplement, not a stand alone. For the novice night sky watching we were interested in, it was clear and concise, which was perfect! Throughout the 21 pages of this book the Classical Astronomy Signs & Seasons curriculum is mentioned. We have not used it but if you love this supplement, (like we do) my guess is their curriculum may be a good place to start looking for one! Disclaimer: I was given a copy of The Classical Astronomy Celestial Almanack Volume 1 Number 2 in exchange for my honest review. My views are my own, and may differ from your experience with the product.